CAMP is a hidden and isolated riverside jungle camp situated in the Buffer Zone of Rajaji National Park. 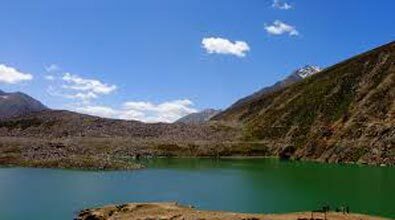 It is located 14 Kms ahead of Rishikesh city and just 6 Kms from Laxman jhula. Our campsite is one of the safest campsites in the area, situated on the edge of a national park and the banks of a river. 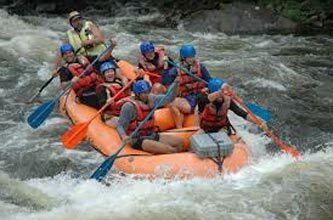 The pleasant sound of the rapids on the river echoes in the valley and camping around such an amazing natural surroundings is an experience in itself. Meet our representative and greet at arrival. Obstacle courses like Burma Bridge, Parallel rope, etc. Group sport activities: Volleyball, Cricket, Badminton, etc. Jeep Safari at Rajaji Tiger ReserveCAMP is a hidden and isolated riverside jungle camp situated in the Buffer Zone of Rajaji National Park. It is located 14 Kms ahead of Rishikesh city and just 6 Kms from Laxman jhula. Our campsite is one of the safest campsites in the area, situated on the edge of a national park and the banks of a river. 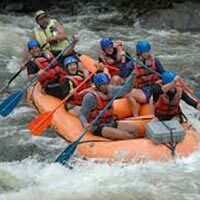 The pleasant sound of the rapids on the river echoes in the valley and camping around such an amazing natural surroundings is an experience in itself. Upon arrival our representative will meet you after that you can proceed your journey and We have specially designed tents with a sleeping area of approx. 120 sq. feet with a canopy in front providing a small verandah. All tents have proper bedding with crisp linen, cots, mattresses, pillows and bed sheets. All tents have sufficient living space and windows with nets for fresh air. Our tents have attached ground sheets and are placed on a cemented platform of around 1 ft height to protect dirt and insects from entering the tent. Unlike other campsites, we have a proper Electricity connection. Sufficient lighting is maintained at the campsite to ensure that the nature can be enjoyed without compromising on the safety. Due to safety issues, no electricity/firerelated articles are permitted inside or near the tents. Power connection is available in the Hall for charging mobile phones, camera, iPods, etc. Also, arrangements can be made for playing music and DJ lights during the Bonfire. Musicians/Traditional dancers can be arranged at a very nominal cost. We have special tin shed Toilets with both Indian and Western style commodes with flush and running water at one end of the camp which also houses Bathing rooms and General wash area. Toilet and Bathing arrangements are in a separate area to keep the bad smell away. People at the camp generally prefer to bathe at the river; hot water is also made available on request. These facilities are setup in accordance with the environmental guidelines laid down by the Government. In spite of the remote location, we are proud of our menu and the various fresh items it offers. We believe in homely cooked, sumptuous food with a varied choice. Camp kitchen takes care of the meals in a buffet arrangement with a large spread. Both vegetarian and non-vegetarian meals are served in the central Dining area as per schedule. Bottled mineral water is procured for drinking and cooking purposes.